Try the “OST Extractor Pro” today and experience the best features of the tool. Fear of data leakage is over. We give you 100% guarantee of safeguarding your data. You will get an amazing interface to recover your ost data. 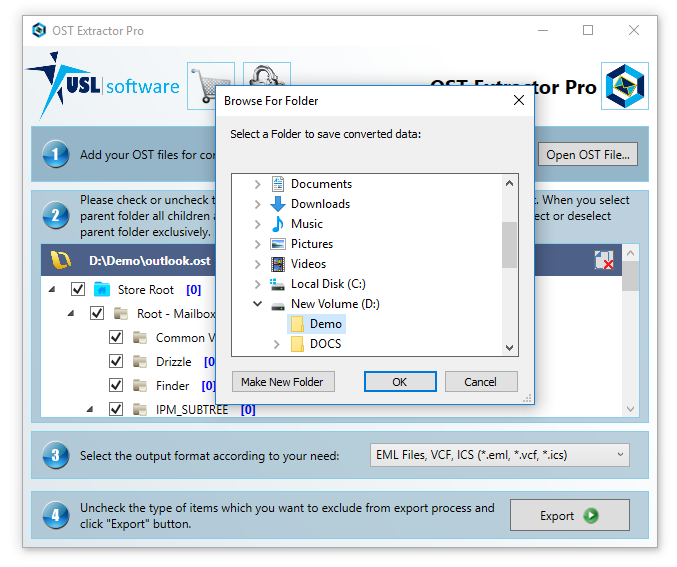 OST Extractor Pro (Works on Mac & Windows) converts OST to PST, Apple Mail, Mozilla Thunderbird, Postbox, MBOX, EML, ICS & VCF file format. Best features of tool make it unique and user’s first choice. Some of the highly attractive features about the tool are- no loss of data integrity, no leakage of data, very secure, high accuracy maintained, 24*7 customer care, Regular updates lifetime, Very fast. Download the software from the link given and install in your Windows or Mac machine. And convert your OST files into PST format. It is very easy process. Just need to follow few steps and the work will be done in no time. Follow the given steps and start working with your tool. Install “OST Extractor Pro” from the download page.After successful installation, launch the software in your machine. Simple interface will appear and ask you for loading your OST file from the system. You will be asked to upload the OST file which you need to convert into PST format. Click on the “ADD OST”. Select ‘*.ost’ file and click on ‘Open’. You have to select the folders you wish to convert into the required format. By default, all the folders are selected. Uncheck those folders which are not required. Select the output format, say you want to convert it into the .PST format. Select the ‘PST file‘ format. Click on ‘Export’ after everything is done. Dialogue box will pop up and will ask for the confirmation. Click ‘Ok’. It will now convert your OST files into PST formats.It will show two status bar. One will show the progress of the individual folder and other will show the overall progress. After converting the files into the PST format, it will show a message ‘Export Process Completed Successfully!’. It will also show that where the log report is saved in the machine. Yes, that’s all. Just in few steps. Don’t waste your time in thinking and test the tool right now by just downloading the trial version. Follow step by step process given with amazing UI. It is such an easy tool to work with that anyone can work with it like a professional in no time. Hurry up!!! Download it and start working. Send your queries regarding any issue. We will be pleased to help you You can download the free demo by clicking here.